You’ve made your Disney resort reservation, bought your airline tickets, bought your theme parks tickets and linked them to your My Disney Experience account. Now what? 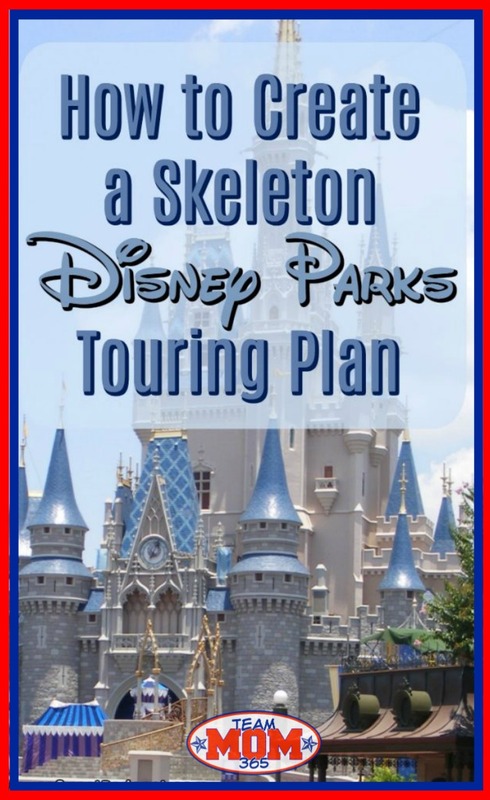 Now it’s time to put together a skeleton Disney park touring plan. This will simply be which park you are going to experience each day of your vacation. 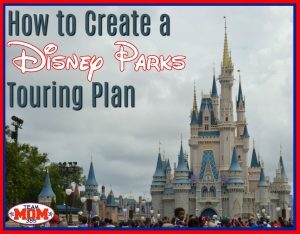 To make this determination there are several factors you will need to take into consideration: Park Hours, Extra Magic Hours, Special Events, Day of the Week, Time of the Year, Weather, and Holidays. During different times of the year the parks have different hours. These hours directly relate to the business of the season. For example, park hours will increase in the summer and decrease in the fall only to increase again around the holidays. Therefore, if a park has expanded hours, especially at night – TAKE ADVANTAGE. There will be times when Magic Kingdom Park is open until 12:00am. I can tell you without a doubt that a vast majority of park goers will exit the park following Happily Ever After leaving the attraction wait times very short. If nothing else, consider park hopping to Magic Kingdom Park on nights when there are extended hours. You will be surprised at how much you can get done in three hours when there are low crowds. A tip about park hours: Make sure to check the park hours a couple weeks before you arrive. Disney has been known to change their park hours when they are anticipating larger than expected crowds. For example, when I was planning my June, 2017 trip, the park hours initially said Magic Kingdom Park would be open 9:00am – 9:00pm. However, a month or so before I left their hours increased to 10:00pm and even 11:00pm on some days. A lot of people think they should take advantage of Extra Magic Hours (EMH). This is true… but only for the time EMH are available. This is because most people will actually make the EMH park their park of the day, especially those who don’t have park hoppers. If you don’t have a park hopper, don’t make a EMH park your park of the day. If you do have a park hopper ticket and there are morning EMHs, take advantage of that hour then hop to another park. If you do have a park hopper and there are evening EMHs, go to a different park during the day then hop to the EMH park at the end of the day. There are two types of special events to consider. These are the Magic Kingdom Park parties (Mickey’s Not-So-Scary Halloween Party (MNSSHP) and Mickey’s Very Merry Christmas Party (MVMCP)) and the Epcot festivals (Festival of the Arts, Flower & Garden and Food & Wine). Unaware party goers (those who haven’t done any research) will make it their park of the day. Actually, if you have party tickets I don’t recommend going to any park that day unless you have a limited amount of time at Walt Disney World. Like I said before, enjoy a leisurely day and arrive at 4:00pm. Another thing to consider when making your park touring plans is finding a night to see Happily Ever After since the parties take place as many as four nights per week leaving only three days (typically Monday, Wednesday and Saturday) to see the new nighttime spectacular. Let me tell you right now, these three nights will be VERY busy. I went park hopped to Magic Kingdom Park to see Happily Ever After on a Saturday after the parties had taken place on Thursday and Friday and it was crazy busy – like Christmas Day busy. So what the heck are we supposed to do?!?! My advice during these times of year is to go to Magic Kingdom Park on a non-party week day either Monday or Wednesday. Just make sure to pack your patience and arrive extra early to the hub area for Happily Ever After. The first thing you should know about the Epcot festival is they are a huge draw for the locals. This means crowds will be inflated on weekends during the festival. Therefore, when making your touring plan when there is a festival, try to schedule your Epcot day on a weekday when the locals are working. These three go together because they are related. When making your plans remember the locals will inflate park crowds on the weekends during the winter months when the weather is good. A local once told me they treat summer like we northerners treat winter – they stay inside! So when “winter” comes they come out to party. This is especially true for Magic Kingdom Park and Epcot. Another factor to consider when thinking about days of the week is that most people arrive on Saturday and want to visit the iconic Magic Kingdom Park right away so they will either check in and head straight to the park or spend their first day acclimating to their resort then head there on Sunday. To steer clear of the arrival crowds I suggest not visiting until Monday or Tuesday of your vacation. The holidays are historically busy at Walt Disney World, especially Magic Kingdom Park. Fourth of July, Thanksgiving day, Christmas day and New Year’s Eve are so busy they have even been known to close due to capacity on these days. (On Christmas Day 2017, Magic Kingdom Park stopped allowing new guests for a few hours after 12:30pm.) If you really want to visit a park on a holiday consider Disney’s Animal Kingdom or Hollywood Studios. Epcot and Magic Kingdom Park, known for their amazing nighttime fireworks displays, are just too busy on holidays. If you absolutely must visit a park on a holiday arrive early, have your three FastPass+ selections already set, have Advanced Dining Reservations in place and pack your patience. 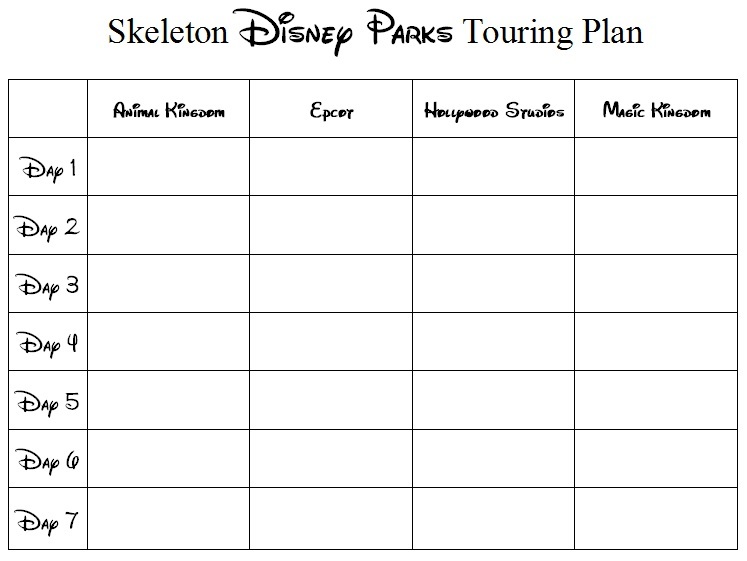 Once you have research all of the above, fill out the form below to make your park touring plan. Sue Nowicki is an alumna of the 2014/15 Disney Parks Moms Panel. She is a team mom extraordinaire who has filled her time serving as secretary, navigator, head cheerleader, treasurer, athletic trainer and team psychologist for her daughter’s travel sports team for over 15 years before becoming a team owner. 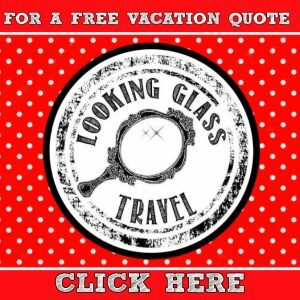 She is also a travel consultant for Looking Glass Travel specializing in Disney destinations. You can follow her on Twitter at @JazzinDisneyMom. Please join our mailing list for more great content. Are you looking to plan a family vacation in the near future? Come to our quote page to start planning the vacation of your dreams.